While temperatures above ground change a lot from day to day and season to season, temperatures 10 feet below the Earth’s surface hold nearly constant between 50° and 60°F. For most areas, this means that soil temperatures are usually warmer than the air in winter and cooler than the air in summer. 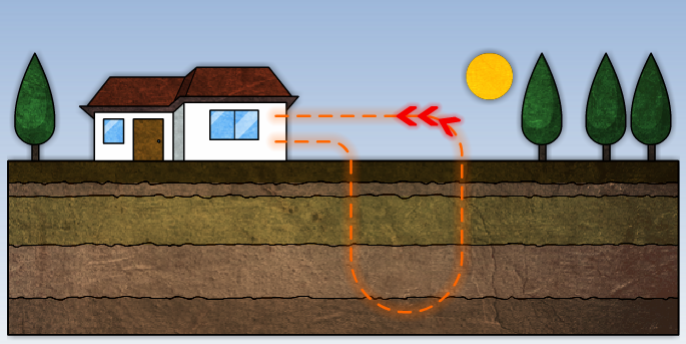 Geothermal heat pumps use the Earth’s constant temperatures to heat and cool buildings. In the heating mode, The water travels down through the earth, absorbing energy in the form of heat. The water carries this energy to the heat exchanger inside the heat pump, where refrigerant absorbs the heat energy from the water. The water then leaves the heat exchanger at a colder temperature than the earth, and circulates again, picking up more energy. Next, the refrigerant gas, which hold the heat from the earth loop, travel from the heat exchanger to the compressor, where the refrigerant temperature rises to 160 degrees. From the compressor, the heat travels to the air heat exchanger, where the heat pump’s blower circulates air across the air coil, heating the air and blowing through the ductwork to heat the home. After the refrigerant releases its heat to the air, it flows back down to the heat exchanger to start the cycle again.